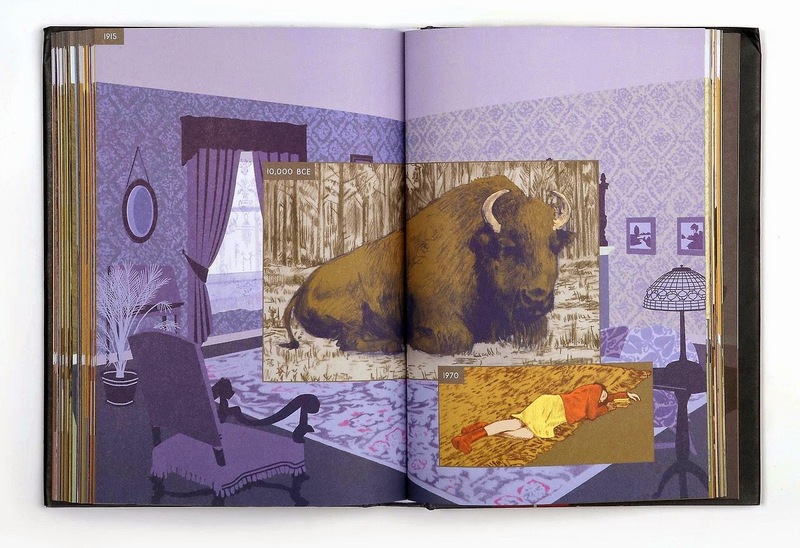 I'd never heard of Richard McGuire's Here until Oliver sent me a link to an article about an impending collected release a couple of months back, and I'll admit I was rather dismissive; it sounded interesting enough, but the piece didn't do a great job of placing context or telling me why I should care. And then, this past week, I came across both Jennifer Schuessler's article 'Sharing a Sofa with Dinosaurs,' discussing McGuire's book and an exhibition of his work, and the Tumblr photo-set Austin Kleon assembled showcasing a number of interior spreads from Here, and I was immediately sold. Originally released back in 1989, Here was McGuire's first published strip, making it's debut appearance in Raw. 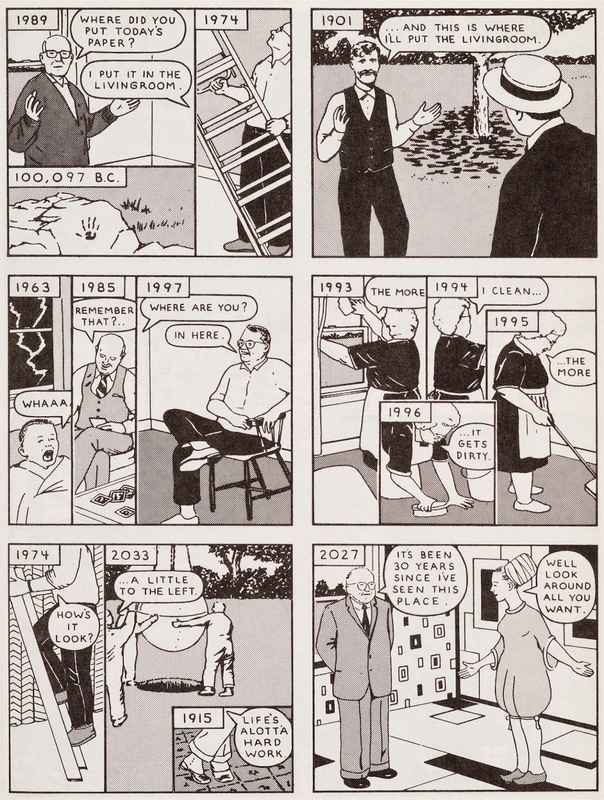 It was set in the corner of a living room, a location it never left, although it moved forwards and backwards in time with each panel depicting that exact same space and what was occurring in it (and what is yet to happen) from year to year- jumping forward decades and then backwards hundreds of years. 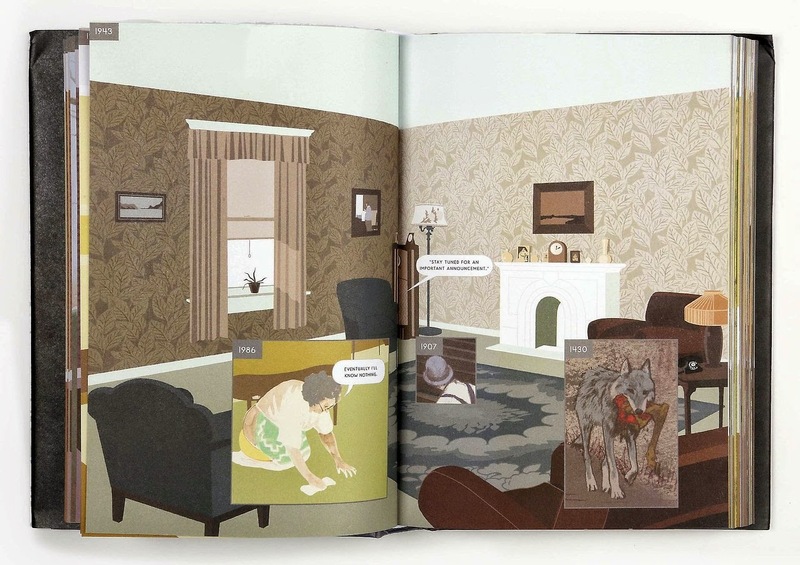 The use of inset panels within panels allowed McGuire to further cut windows into different eras, so that a single panel could show a resident of the house that sometimes stands there as a baby, as a young man, and then elderly and bowed. Another panel is divided into four smaller sections, each one showing the same woman cleaning in 1993, 1994, 1995, 1996- the banal repetitiveness of life quietly passing acutely captured. It's such an ingenious concept, presented over only 6 pages and in 35 panels. However, despite a couple of attempts, and interest from publishers, McGuire never got around to expanding on, or finishing the strip -until now. From 35 panels, Here is now a 300+ page full colour book due for publication this November, and covering the periods between 500,957,406,073 BC and 2033 AD, with (from what I can tell) many of the individual panels presented as double page spreads that allow you to take in all that is happening. If that is indeed the case, I wonder if it will lessen the impact somewhat, of one page encompassing a multitude of time and eras, and the weight and awe that that imposes. The book also sees McGuire look to the future more, from rising seas, radioactive disasters, new life, and the dying of the sun.